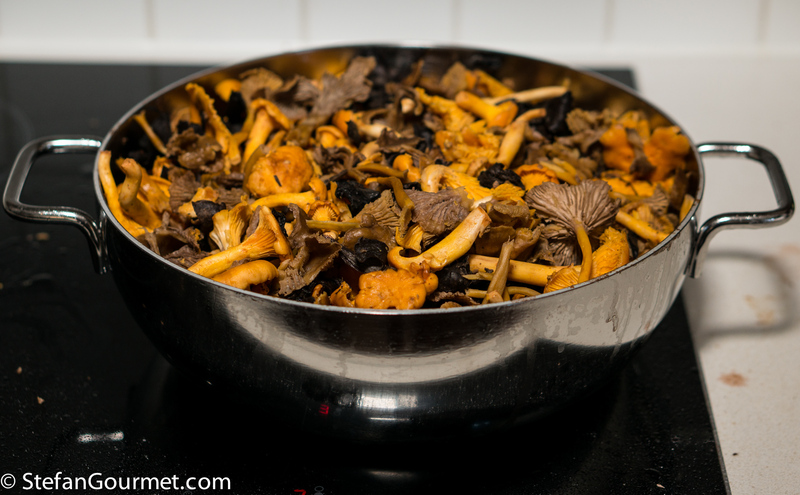 1 kg (2.2 lbs) mixed wild mushrooms, such as chanterelles, horn of plenty, etc. 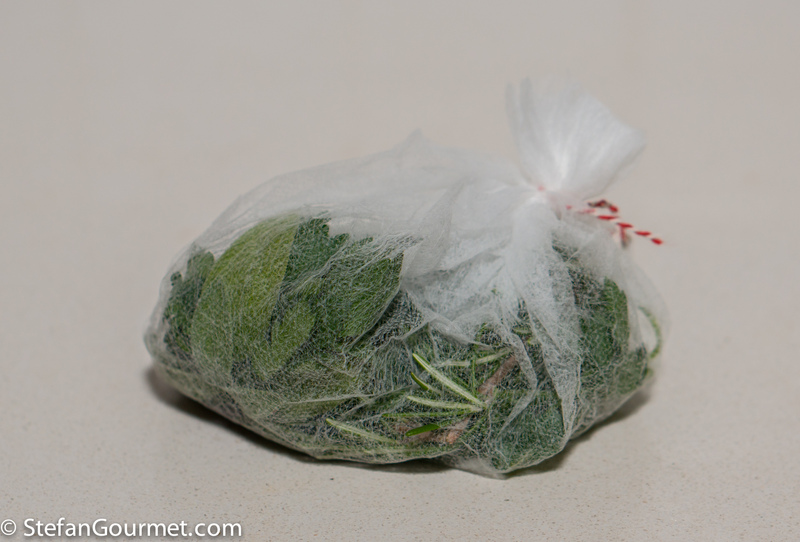 To make it easy to remove them later, I put all the herbs and spices in a hairnet (you could also use some muslin). 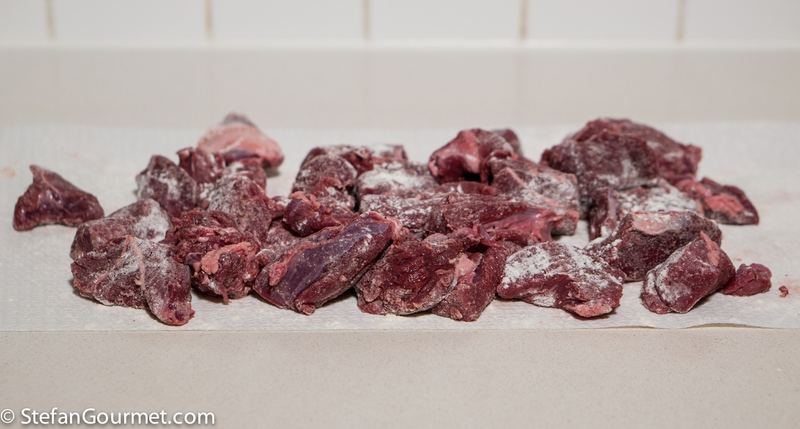 Season the venison with salt and freshly ground black pepper, and dust with flour. 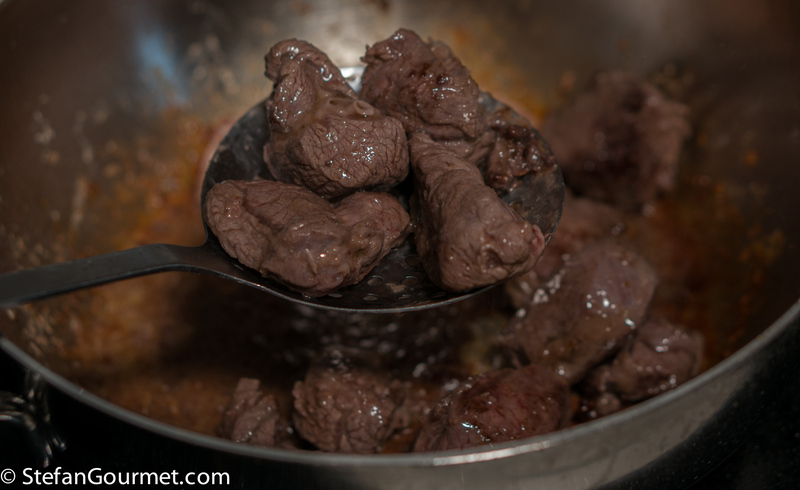 Heat 4 Tbsp olive oil in a casserole and brown the venison in batches (to avoid crowding the casserole) over high heat. …and set aside on a plate. 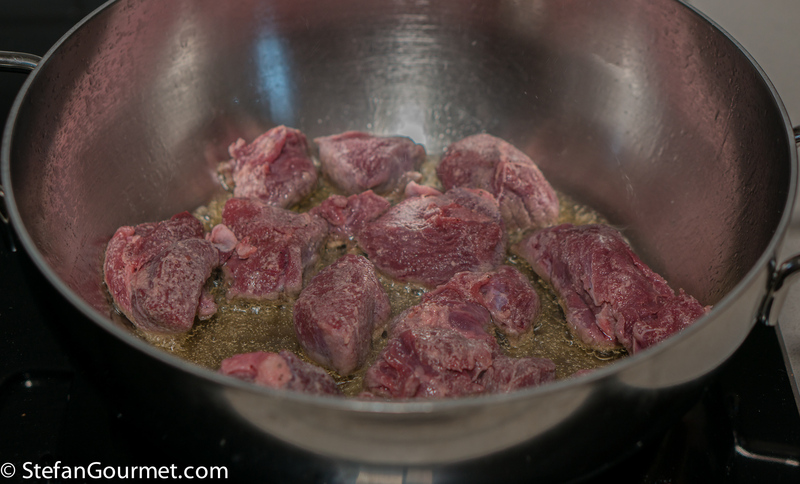 Continue until you have browned all of the venison. A nice brown crust should have formed on the bottom. 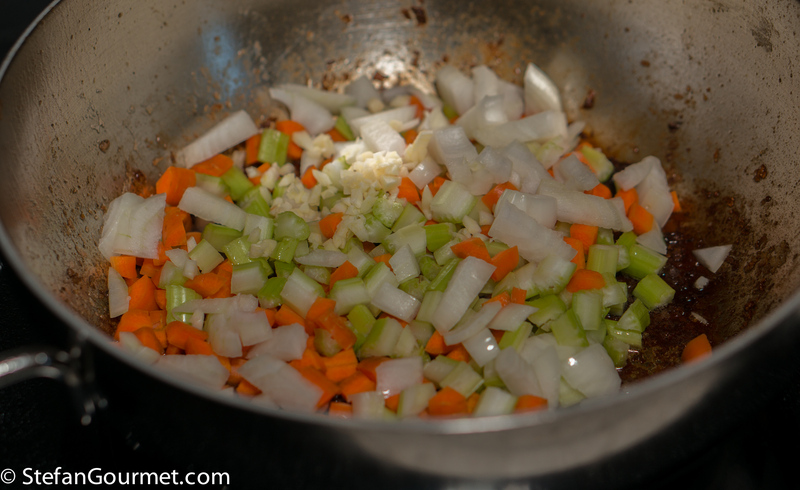 Add onion, celery, carrot, and garlic, and season with salt. Cook over medium heat, stirring to loosen the brown stuff from the bottom of the casserole, until the vegetables are getting soft and starting to color, about 10 minutes. Add 250 ml of red wine. Add the meat, including all of the juices that have accumulated on the plate. Distribute the meat in an even layer. Cover the casserole and lower the heat. Cook over low heat until the mushrooms have wilted and released a lot of liquid, about 45 minutes. …until the meat is tender, about 4 hours. Do not add any liquid during the cooking. If you stir now and then, that is not necessary. The meat does not dry out from lack of liquid, it dries out if the heat is too high and/or if the meat is too lean. 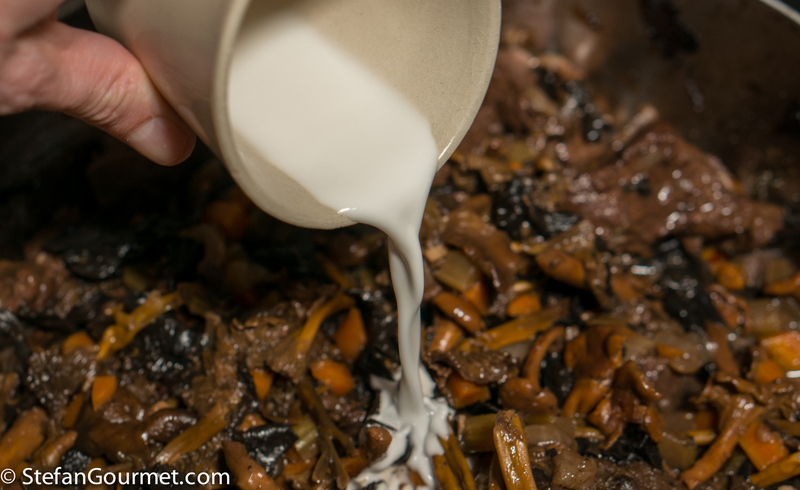 The liquid (both from the meat and from the mushrooms) will be reduced gently, thus concentrating the flavor and creating a very tasty gravy. Remove the herbs and spices. To thicken the gravy, mix a tablespoon of cornstarch or arrow root with a tablespoon of cold water, then add this slurry to the stew. 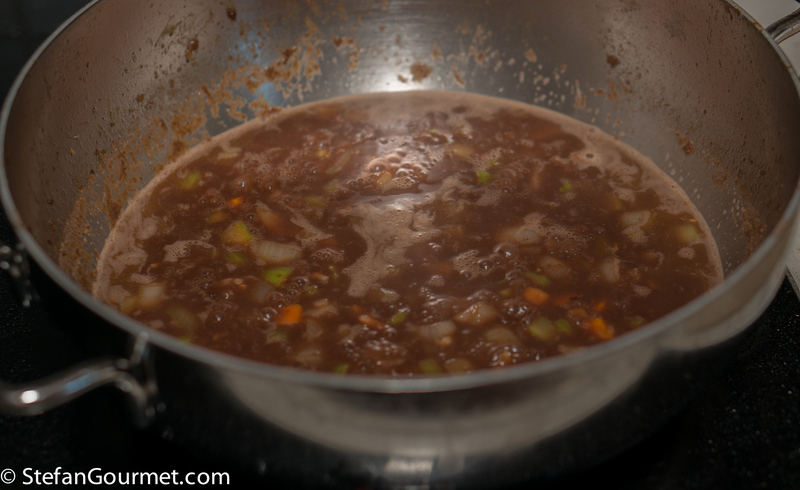 Increase the heat to medium and stir until the gravy has thickened, then turn off the heat. 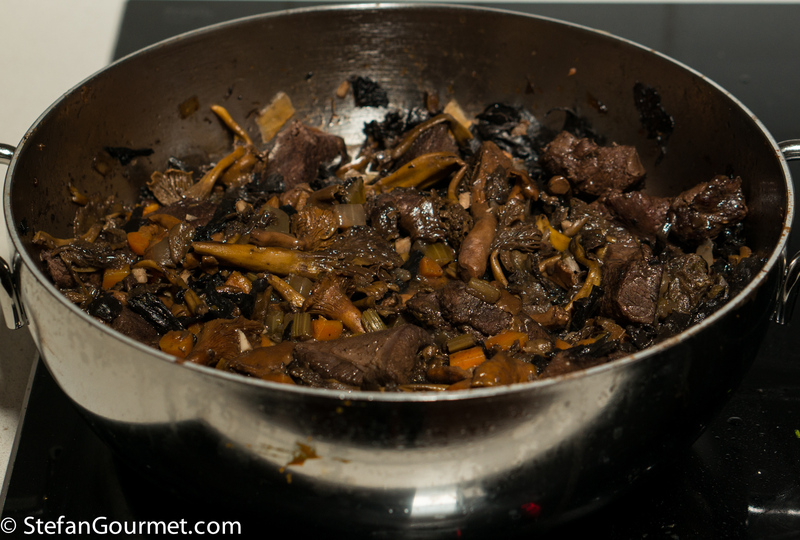 Serve the venison and mushroom stew on preheated plates. 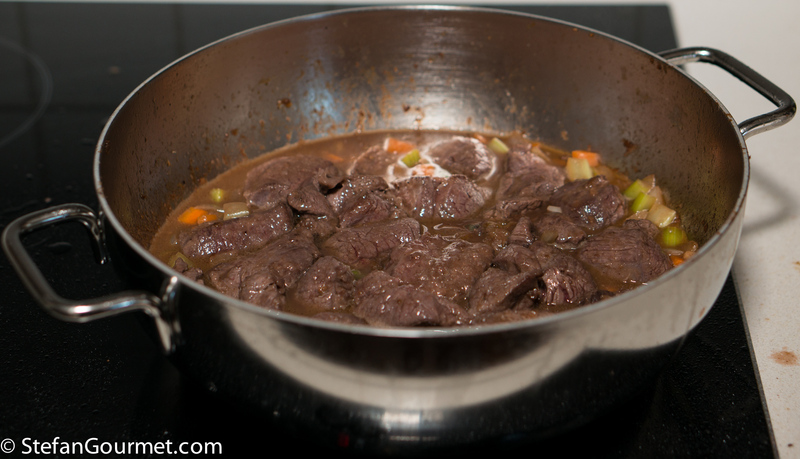 The stew will be even better the next day, but make sure to reheat it very gently to prevent drying out the meat. 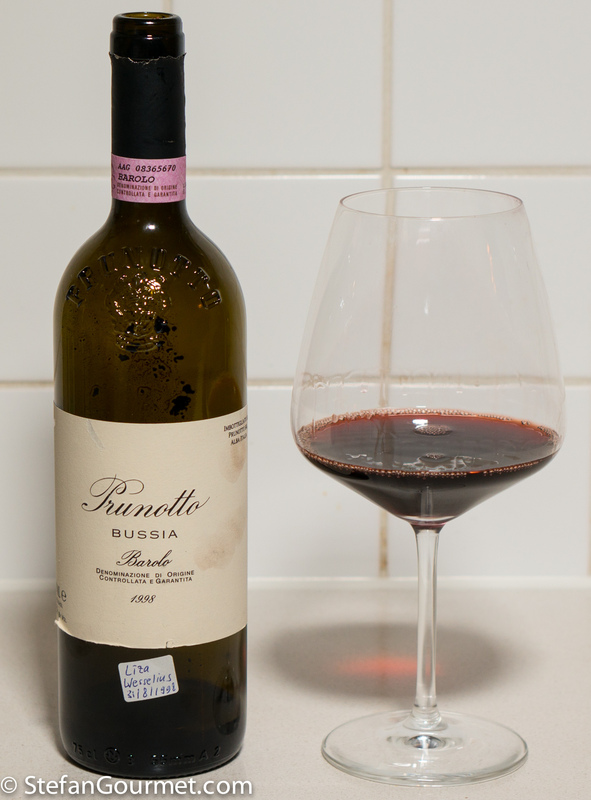 After the intro it is clear that we had a 1998 Barolo with this. It was outstanding. 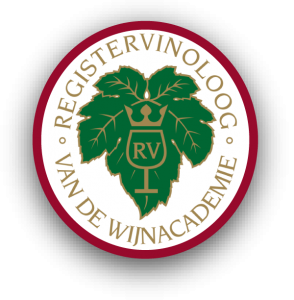 Another full-bodied earthy and/or spicy aged red wine would also work, like a Rioja Gran Riserva or Châteauneuf-du-Pape. 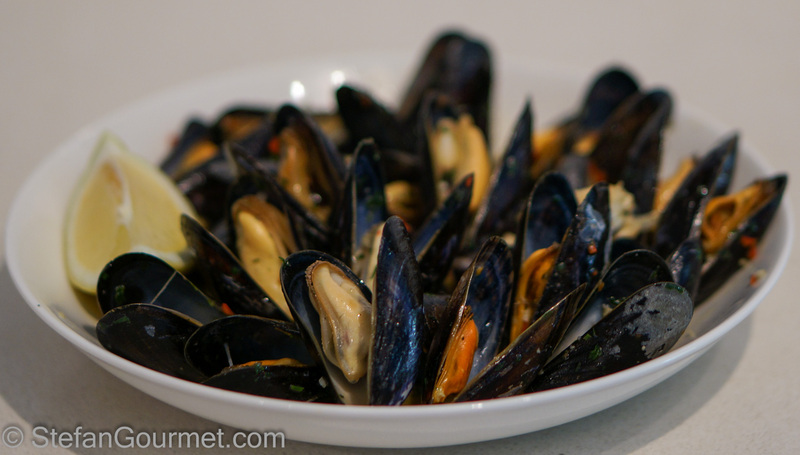 This recipe is so simple that it is hardly worth calling a recipe, but it sure is a delicious way of preparing mussels and so I’m sharing it with you anyway. Impepata di Cozze is a typical dish from the city of Naples. It basically means mussels with pepper, and that is why I made it with two kinds of pepper: both freshly ground black pepper and fresh red chile pepper. White wine, parsley, garlic, and olive oil are all the other ingredients you need for this very tasty dish. Naaa! Hai abbandonato per una volta il sottovuoto! Più vicino a noi comuni mortali! Con sottovuoto naturalmente il cervo sarebbe stato più tenero e succoso, ma non ho già esperimentato abbastanza per trovare la temperatura e tempo adatto. Che dire! Per questa volta sei perdonato! Stefan, you know that this is just my kind of dish. Lovely method. I am impressed with the huge quantity of mushrooms. Fantastic price indeed. We would probably pay about 5 times that. Stefan I was wondering if and where you lived in Italy ? I’ve never lived in Italy, but I do love going there and for that I have learned the language. I have been to Torino a couple of times and it is a nice city indeed. I’ve been following your food-blog for quite some time. I have no idea how I stumbled upon it but I enjoy it. Very inspiring. So thanks a lot! I learned from a cooking course that there’s no reason to dust the meat with flour before browning, that actually it can prevent the meat from properly caramelising which gives great flavour and also you might burn the flour. The purpose of the flour is to form a roux of fat and flour to thicken the sauce, and it could just as well be sprinkled (“singer” is the french term, right?) 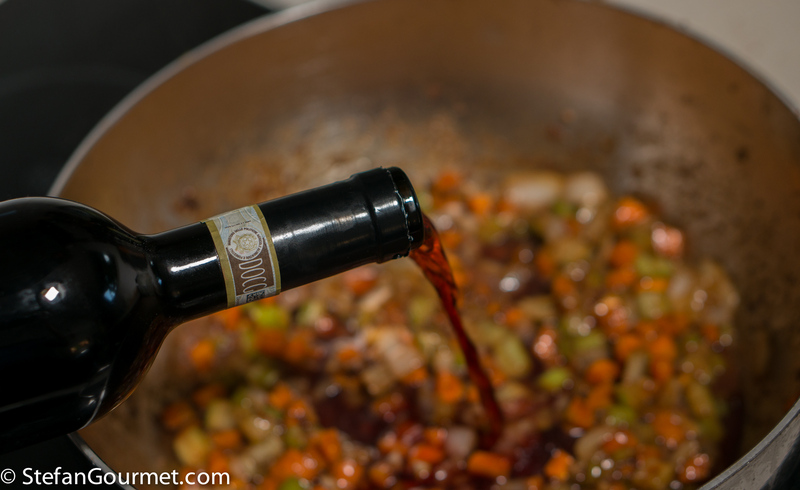 over the vegetables and cooked for a few minutes before adding the wine. Does this make sense or do you think otherwise? 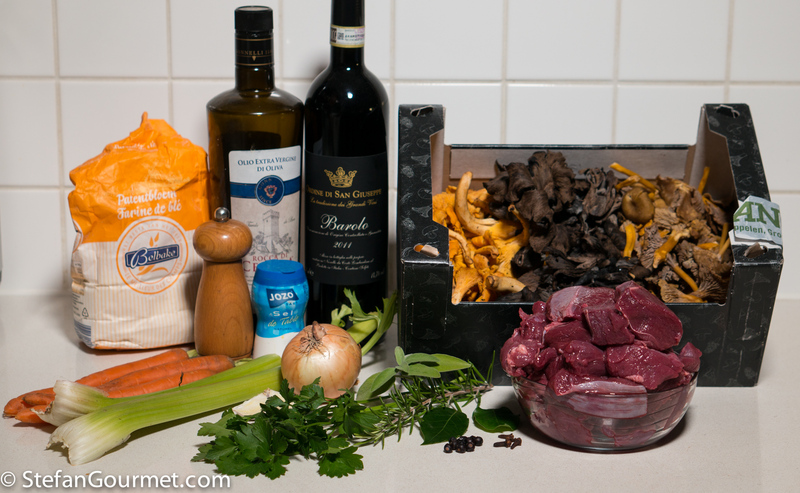 I bought venison the other day and thought I would make a casserole, I didn’t think of wild mushrooms but I’m definitely gonna make this dish. Dusting with flour does seem to help browning fish and white meat, but I have noticed it works less well with red meat. 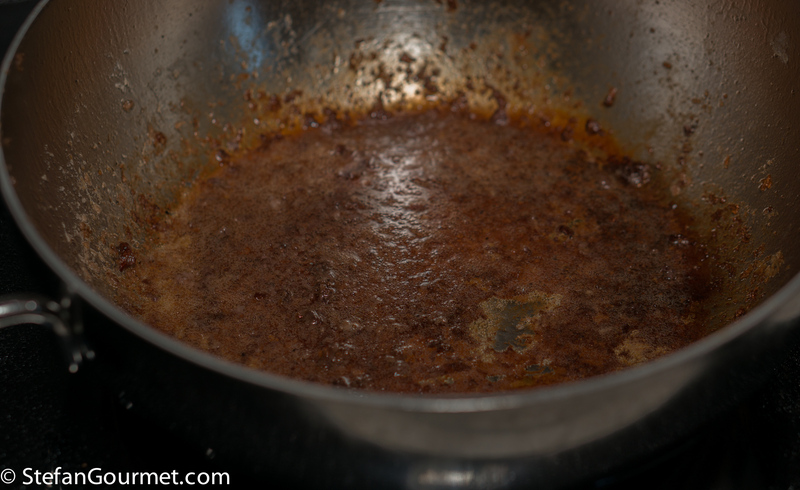 The browned flavors develop anyway, just not on the meat but on the bottom (as you can see in the photo) and it will still end up in the sauce. 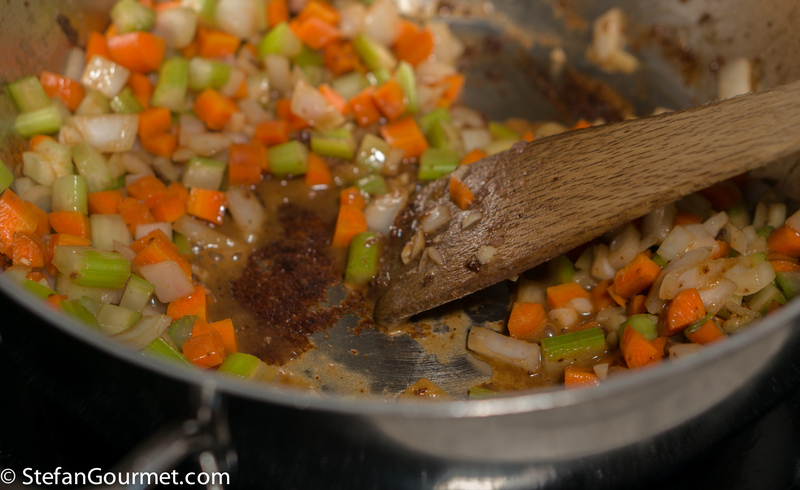 You are right that you have to be careful not to burn the flavorful layer that will form on the bottom of the pan. If you do make this dish, let me know how it turns out! It turned out really nice. Very tasty and very very mushroomy and with nicely balanced notes of the herbs and spices. 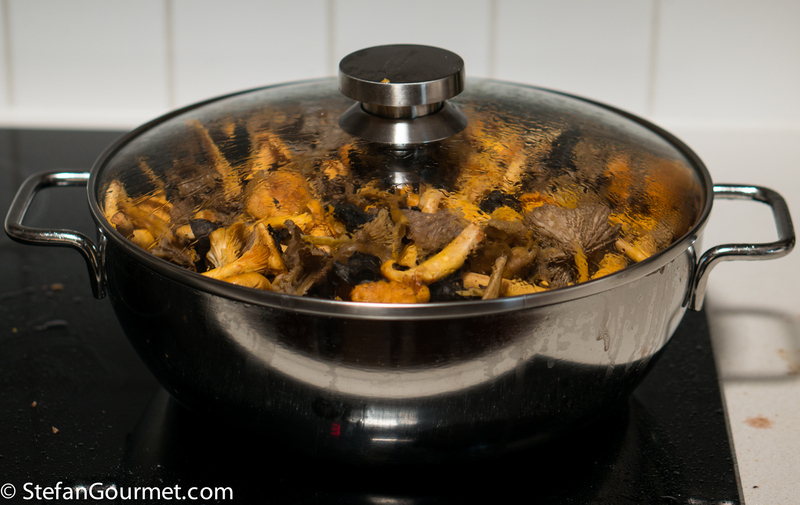 I used mostly (expensive) chanterelles but also some wild firm ones I don’t know the name of and some regular brown mushrooms. 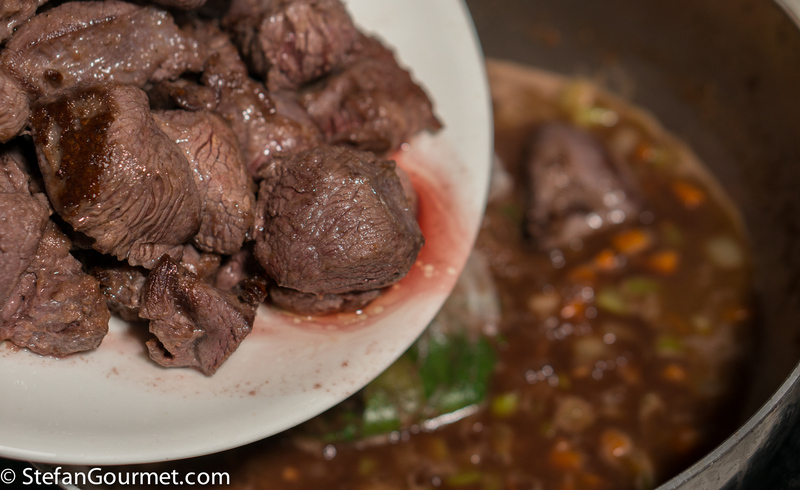 I happened to have two different cuts of venison, a topside and a flank, neither are great cuts for a stew. 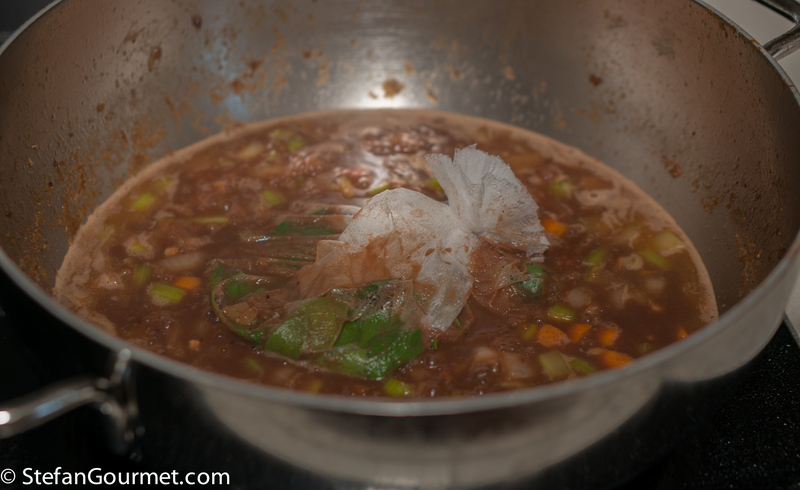 The flank was organic and of much better quality and probably a better cut for stewing with more tissue and fat. Unfortunately I didn’t have quite enough time for my first batch, I would have liked to simmer it (in the oven) at under 100°C for many hours, but had only 2 hours before guests was to be served. It was still wonderful but the second batch the next day, which goes in the freezer, was cooked longer and was even better. I also made the sour cabbage dish which was fun and interesting and complimented the stew really well. And I served mashed potatoes to please the kids and a simple green salad. All in all succesful and great with the mushrooms actually being the dominate ingredient. A different cut of meat the next time, probably chuck, and lower temperature and longer cooking 🙂 Thanks for the inspiration! Hi Sune, thanks for reporting back and great to hear it turned out well. 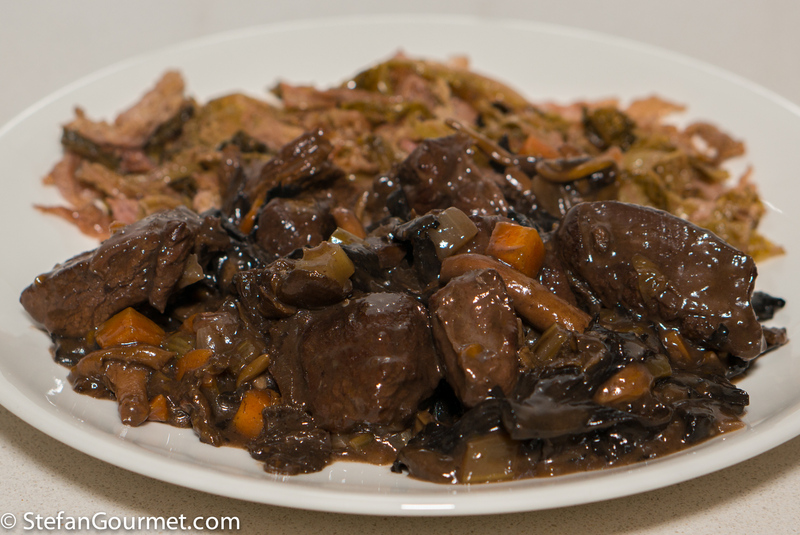 It is difficult around here to source good venison, too, because all but the nicest parts are diced up and sold bagged as “stewing meat”, mixing all the different cuts. I’ve never seen venison with marbling, that would be awesome. Wow, those mushrooms! I can only imagine the lovely taste of this. So is the drinking age 18 over there? The mushrooms were quite lovely. The drinking age here is 18, and actually used to be 16 until a couple of years ago. Autumn in Europe: you have made me just a tad ‘homesick’. Somehow kangaroo and Chinese mushrooms don’t quite ring the same bells as venison and chanterelles but shall try 🙂 ! Hairnet a brilliant idea: I have a roll of muslin cloth and just snip off the required length!!! I thought it was funny that kangaroo was right next to dogfood in Australian supermarkets, but here it is thought of as an exotic delicacy. So it actually doesn’t sound bad. 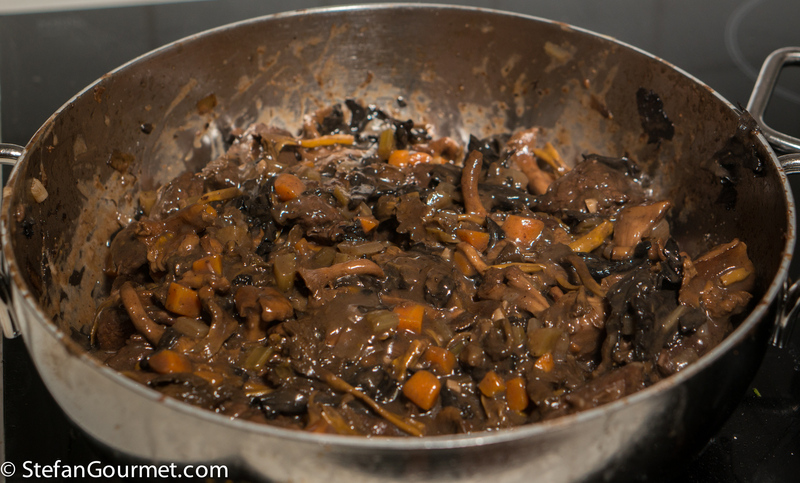 You could use dried Chinese mushrooms and include the soaking liquid with the stew. 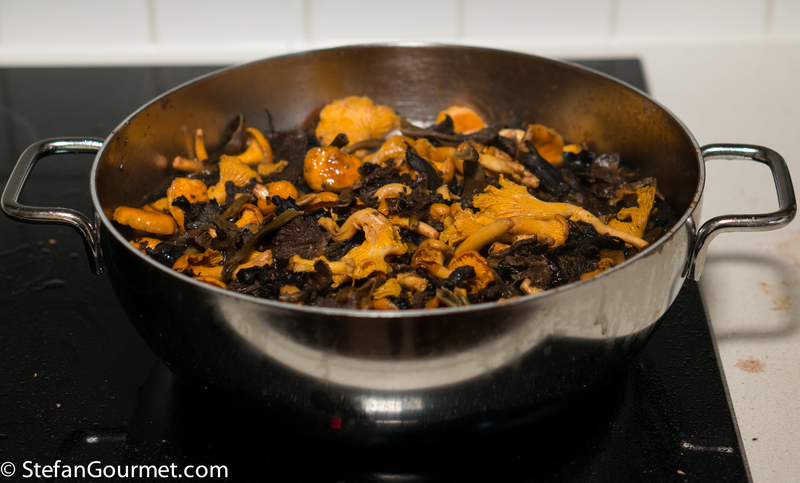 Is there such a thing as Australian wild mushrooms? I’m not a huge stew eater, but this one is exquisite! I have been following your blog for couple of months. This is a classic dish. Love it. Anch’io ho notato che (finalmente!) niente sottovuoto ;). Grande ricetta per un grande vino, complimenti. Che ha detto la festeggiata? I’ll admit, Stefan, that I grow a little envious whenever you feature venison here. I just cannot find it here or, when I do, it’s already ground. This stew that you’ve prepared sounds wonderful. Your niece is one lucky young woman. By the way, great tip using the hairnet for the herbs and spices. Much better, and more effective, than tying them into a bundle.